So this past week, I became an old woman. I’m not talking about grey hair, or creaking bones, or any of that standard stuff. (Though, I’m getting those as well.) No, this kind of aging was the stereotypical old-woman-in-a-home kind of thing. I became a pill-popping, coughing, miserable mess. It’s one thing to get the flu. But getting the flu on top of getting cancer just pisses me off. I mean, seriously? Because if you’ve ever had the flu, you know that you feel like dying. And if you’ve ever had cancer, you know that you might legitimately be dying. Wrap those two together and you might as well just be knocking on the gates. There is tremendous irony at play in the world. Apparently, as my oncologist pointed out to me as I was hacking up a lung, the medicine that I am on could weaken my immune system. That translates into: your cold is my pneumonia. So that aside, I suddenly was prescribed a whole host of pills and medications that became part of my daily regimen for ten days. You might not think that’s such a big deal, but when one of the pills is roughly the size of a healthy newborn, I start to wonder if the drug companies have lost their collective minds and if maybe, just maybe, they’re out to kill me. But I took that mother of a pill. Every morning and every night. Even though I was still coughing so much that I could no longer speak. And then came the prednisone. If you aren’t familiar with that happy pill, let me paint it out for you. Some people have become psychotic taking it. Some people have become violent. Some people have actually driven cars off cliffs because of prednisone. But that didn’t concern me. High on my list of side-effect priorities was the one written under the psychotic break: May cause weight gain. 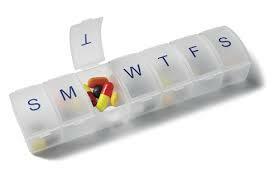 Between the Prednisone, the Augmentin, the Tamoxifen, the Lexapro, the Nyquil, the Sudafed, the Advil, and the Cough Drops, I needed one of those pill cases my grandmother used to have with the days of the week printed on top. I told my doctor I was considering becoming a meth addict because at least I would lose weight. And if I was going to become a raving homicidal maniac, at least I’d look good in court. Oncologists, I’ve discovered, need to work on their humor. I shouldn’t complain. Though it’s true, there are probably more drugs in my blood than platelets, and I did try and kill my husband in his sleep because he put the “wrong” sheets on the bed (he forgave me – Prednisone perk), at least my coughing has stopped and I have no fever. Also, it isn’t like it’s cancer or anything. THAT would be much worse. Amazingly funny! Go AW Ciment! I can relate (and by the way- your immune system does become compromised- but it does get better). BUT -how can you be getting old when I am not- and I am turning 70 soon? Be well. Love you. i friggin’ love this blog. Never ceases to make me laugh, smile, cry, and sometimes all at the same time. Sending love down south from the near-arctic here in Binghamton. This blog friggin’ loves you too! I was scared to try the Adderall with the Prednisone. I thought I might find myself standing on a rooftop yelling, “I AM A GOLDEN GOD!” And that wouldn’t be good for anyone.